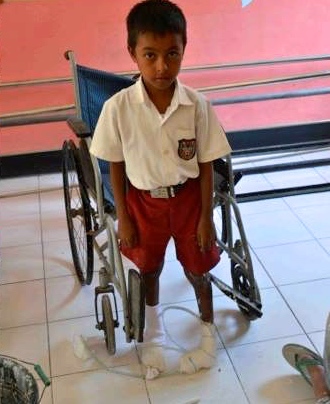 LETS GET 27 CHILDREN ARMS OR TO WALK FOR THE FIRST TIME DonaTION INFORMATION "At $297 Per Person, I believe there is no INDONESIA Humanitarian Project that achieves so much for so little". 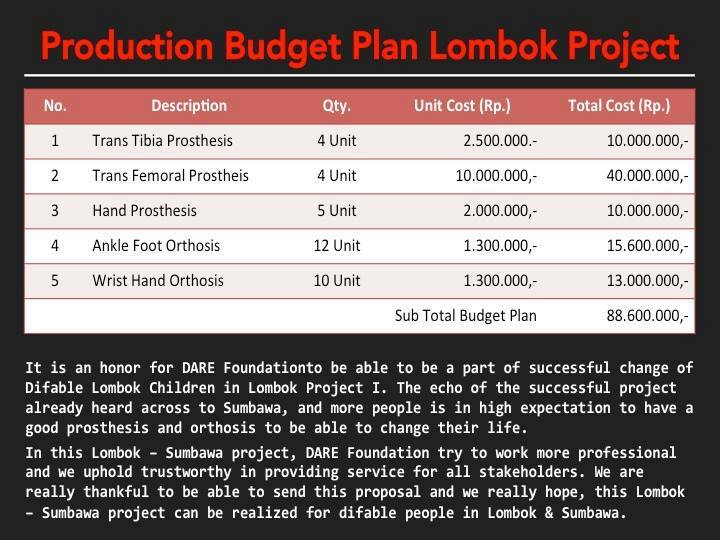 The numbers of Lombok Forgotten disabled ARE VERY large - Nothing significant will be achieved to help these people if we keep doing projects one person at a time. 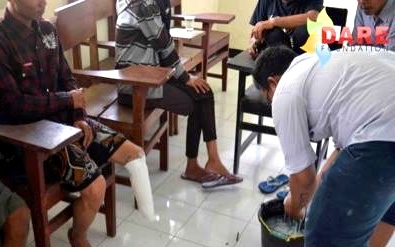 I look forward to sharing the 'after' photos of these people walking on their new prosthetic legs. 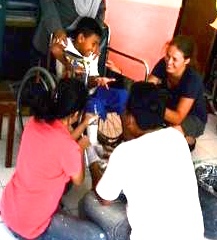 Dr Cokislela is a Indonesian prosthetics doctor & was very stressed & confused as to what to do recently. 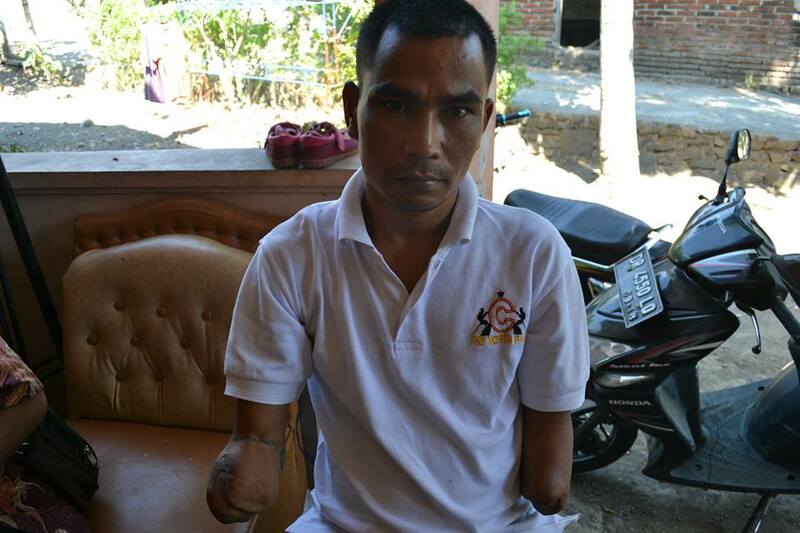 After taking moulds from the villagers disabled limbs to build legs & arms for 22 poor villagers, his project now faces jeopardy as the moulds he has taken risk of deterioration and he needs $7277 funding help for all - we have now raised almost $3,000 and he is using the money in building them now. We are now presently forming our project funding team and warmly welcome people to join this project. Thirty more disabled people turned up for help! While Cokisela was fitting out the below 7 children. Above are the before and after photos of Cokisela's visit & work in Lombok. Nb. These people are very poor & have no means to afford legs & arms. Dr Cokisela took the initiative and with a quick bit of funding help during this time we completed the first stage of the project in taking the necessary moulds has been paid for and completed. Below: Dr Cokisela last Lombok Visit & the 7 Lombok Forgotten Children he helped. How did we end up with so many? Lombok forgotten Children connected some seven children up to Mr Cokisela from the Dare Foundation in Jakarta, in which he supplied limbs arms at a price that is 1/10 of that from other foundations. Project Transparency: Cokiselia & his 'Dare Foundation' from Jakarta offered a affordable low cost solution, when in Indonesia I am always bit skeptical but so far he has proven to be very trustworthy & professional. Mr Cokisilea has also promised to send walking happy photos of every person to us at the end of the Project. Endri from 'Lombok Forgotten Children' will be available to return photographs from the delight of each person. The First Seven Completed √ but 30 more turned up for help! 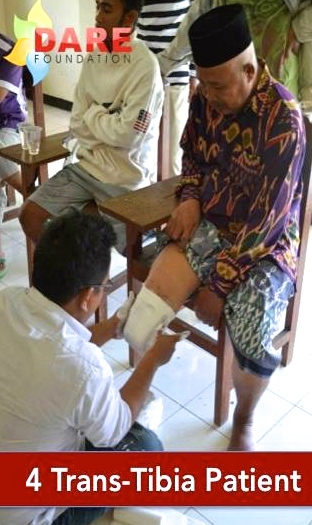 Below is the before and after photos from Dr Cokisila's 1st & 2nd visits to Lombok/Sumbawa. While fitting the limbs during the second visit word got out and 30+ more disabled people turning up for help. During this stage LFC assisted with urgent funding for supplies so Mr Cokisela could take the moulds from 25 people while he was there. Sadly he did not have the materials to do all and during this coming project we will prepare to take moulds for up to 30 more people & a possible future project. Above Photo: Some of the 22 disabled people with Dr Cokisela taking moulds. 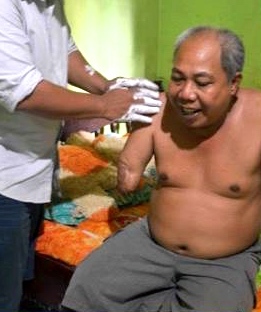 These people are now waiting for their prosthetics limbs but funding is required. How & why the costs so affordable? 1. Supply from Cambodia: Firstly the prosthetics are made in Cambodia by a joint venture American project for their many war victims, this country also has an academy set up and Cokislea of Jakarta doctor trained there. The quality is excellent & they are light weight. 2. Working in Bulk Numbers: has reduced travel and many other expenses which have excitingly dropped the required funding to help in a significant manner. The below photos are of Mr Cokisela taking the required moulds, which he has taken back to Jakarta. "Praise Alah, thank you thank you they said, the government have forgotten us and don't care." 17. 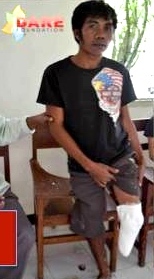 Name: Dhea Age: 15 y/o Device Req: Bilateral Ankle Foot Orthosis (Both Leg) and Wrist Hand Orthosis for Right Leg. 21. 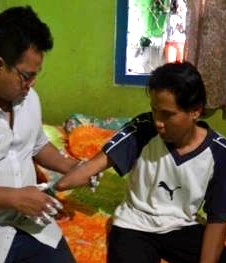 Name: Mr. Suhadi Age: 58 y/o Device Req: Ankle Foot Orthosis for Plantar Flexor Muscle Weakness. Please note the stage one cost component has been completed, also Mr Cokisela will travel to Lombok with all his equipment in his foundation vehicle. "Bang for Charitable dollar I doubt in Indonesia there is another project that offers such a high output humanitarian return as this project." Over the past 8 days of Travelling between Lombok & Sumbawa, we had encountered many challenges and silly obstacles.....Nonetheless, we stay focussed on our goals and to our mission …. It was chaotic....Many people did not answer their phones and so arragement are made last minute…. Our plight to the local government had fallen on deaf ears…. NPO PROJECTS.ORG IS ABOUT EMPOWERING PEOPLE WHO SPARK COMMUNITY AND ENVIRONMENTAL PROJECTS. Above is Pira from Sumbawa who sparked the discovery of so many forgotten children.